I will confess being skeptic when I first heard that Jaguar was going to jump into the ultra competitive compact saloon market and go head to head with BMW, Mercedes, Lexus and Audi. 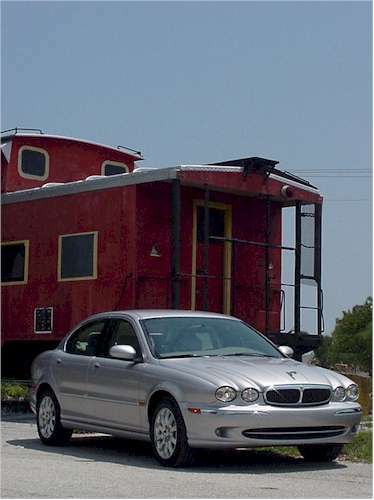 Like many enthusiasts, the thought of Jaguar elegance being squeezed in a shorter car was not something I thought Jaguar designers could pull. 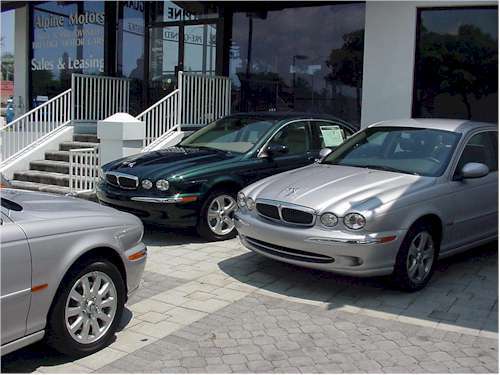 When I got to Alpine Jaguar of Ft Lauderdale and told my sales consultant Larry that I wanted to test drive an X-type, he knowingly asked me "which one, a 3 liters ?" I declined and told him I wanted to drive the basic 2.5 liter stick shift no options no frills $ 29 950 car and he pointed out to a Platinum Silver demonstrator parked outside. He also said that he'd keep my XKR hostage while I'd take the X for an 30 minute spin... sounded good. While he was getting the keys, I took a good look at the car and it looked very much at home in front of Alpine's showroom parked next to an XJ8 and my own XKR. Just another elegant and refined design as we expect out of Coventry. Yes, it is smaller and shorter than most Jaguars we've seen but there is more to its elegant lines than just the styling clues, it's very well proportioned and pleasing to the eye. Honestly, Larry didn't actually mention the hostage part but he did hand me the key and soon I was heading out of the Alpine lot. First impressions are often the longest lasting and right away the car felt nice, I felt at home: the X-type is a real Jaguar despite its size. I wasn't sure what to expect in term of performance from a 2.5 liter V6 developing 191hp; to be fair, I should mention that my daily driver is a 370hp Supercharged XKR so I am totally and hopelessly addicted to horsepower. Half the ponies didn't sound like much but in fact, the X-type felt quick and turned out to be fun to drive. The 5 speed manual works really well too. We all know that it's been years since Jaguar sold a manual car in the US but they've been selling them in Europe, S-types and XJs, and it shows. Shifting is short and crisp in the first four gears with 5th being just a bit longish. When starting from a standstill, it helps to keep the pressure on the throttle as the V6 is not meant to pull from 1000 rpm but there is little risk of stalling the engine. When accelerating and shifting out of 1st or 2nd, I found the RPM not dropping immediately and I'm wondering if they didn't keep the flywheel on the heavy side. Nothing wrong with that of course, it may actually help out when starting from a full stop if the clutch is released to quickly. 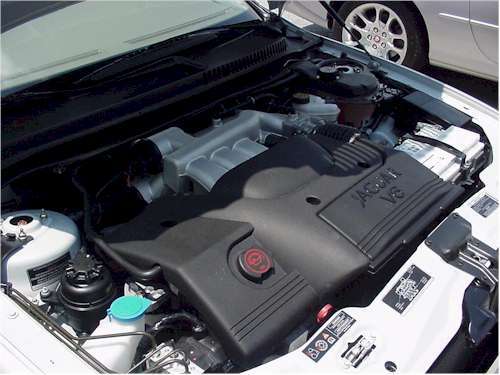 Above : Ford based but Jaguar refined aluminum V6 engine, transversally mounted, a first for Jaguar. 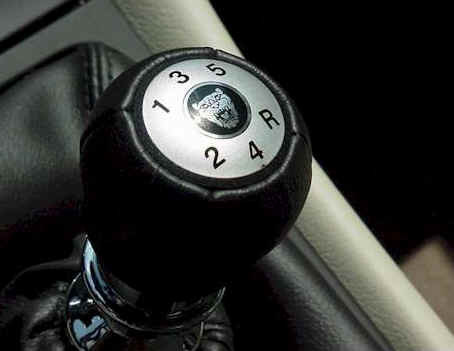 Below : the Traction 4 All Wheel drive system, another first for Jaguar. The 2.5 liter V6 is responsive throughout the RPM range even below 3000rpm giving the drivetrain the refinement Jaguar owners will expect; this is no 8000rpm Japanese screamer and pushing revs higher will not be needed. Indeed, looking at the power and torque charts in the brochure, peak torque is achieved at 3000 rpm for both engines ( 180 and 209 lb-ft) and remains available through 5000 rpm ( closer to 6000 rpm for the 3.0) where the horsepower curves starts to flatten. 0-60 times are a spirited 7.9 and 6.6 seconds for the manuals and 8.5 / 7.1 for the automatics. I was able to take the car on I 95 for a few miles and was pleasantly surprised with acceleration. 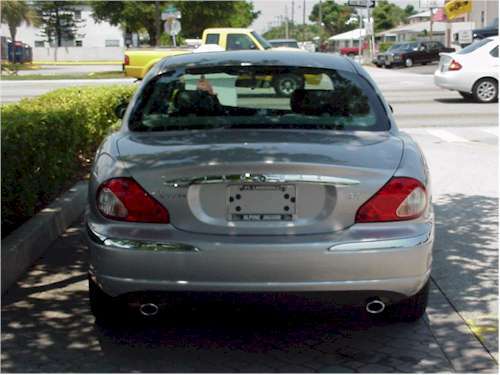 Again, despite being a base model, the X-Type accelerated quickly to merge into traffic or to pass. Noise levels are low even at highway speed, something expected from a Jaguar of course. The variable ratio speed sensitive steering is very responsive but not overly so, the driver doesn't feel disconnected. The all wheel drive system cannot be appreciated on dry roads but otherwise the X-type feels very much like a traditional rear wheel drive Jaguar... a real car... you don't feel any torque steer through the steering wheel as you would on a FWD car. This is in part due to extensive work done by Jaguar engineers to refine the ride and the use of special bearings in the upper part of the front shock absorbers. All Wheel Drive will be a big plus for Jaguar in places where the weather isn't as nice as Florida and give the X-type a strong edge over Lexus and Mercedes; compared to BMW and Audi where AWD is an option, the Jaguar will have the edge in pricing. Because of the unique handling characteristics of the All Wheel Drive system, Jaguar engineers had to develop an all new electronic Dynamic Stability Control and after testing similar systems from Audi and Mercedes they decided to follow the models used by Porsche in its Carrera 4 911; it keeps the driver in the equation according to Jaguar engineers by allowing some limited slipping before stepping in. After bringing the car back to Alpine ( those 30 minutes felt awfully short, a good sign), I took a closer look at the details inside the X-type. As first noticed the fit and finish is excellent, this is no second class citizen in the Jaguar line up and it might be built in a former Ford UK plant but its workforce was indeed re trained to Jaguar standards. Woodwork is similar to what is found in the more expensive cars and the leather on the standard power seats is just as nice as well. Only detail that didn't feel quite as nice were the plastic parts on the A/C and stereo system control which lacked the texture found in the XJs and XKS , costing twice as much of course... 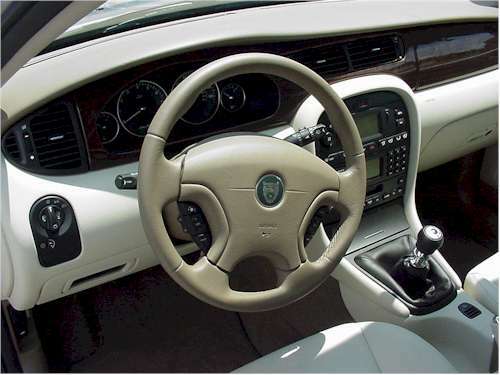 The leather wrapped steering wheel is fully and manually adjustable but also slightly smaller than on the larger cars, a plus; just behind the easy to read instruments are outlined with chrome trim surround. 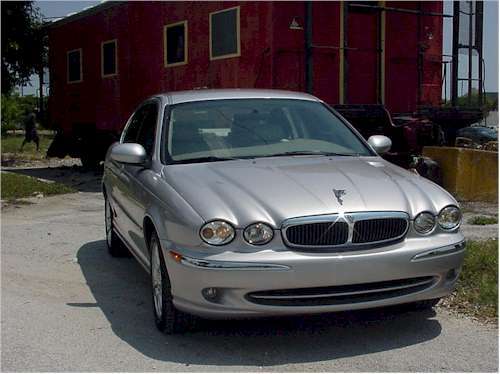 The base model includes an LCD mileage display which is a little harder to read under certain light conditions compared to brighter display used in other Jaguars. One thing the interior design team worked on real hard is storage as the X-type is full for storage compartments for all those little things we seem to accumulate in our cars... Of course A/C and Stereo controls are easy to use and both system work as you would expect on Jaguar. I was also surprised by the amount of room in the back; leaving the driver seat as it was, I sat in the back in was very roomy and comfortable, almost as roomy as an XJ8... impressive. Then moving further back, I found a very spacious boot which can be even more convenient with the 70/30 folding rear seat available in the Premium option package. As seen in the table above, the most important decision prospective buyers need to make is what do they want under the hood... ugh bonnet... which by the way opens the wrong way, for a Jaguar anyway, hinged from the back. The V6 comes in two flavors : 2.5 liters and 3.0 liters developing respectively 194 and 231 horsepower, very respectable numbers considering the size and the weight of the X-type, 106" wheelbase and 3428 curb weight. The price premium for the larger engine is substantial, $ 6000, so it's more than likely that most X-types will be sold with the base engine, just like the S-type where V6 versions outsell the V8. Transmission choice is important and closely tied to engine choice for two reasons. First, an automatic transmission is not as efficient and responsive as a manual, a problem which is less noticeable on a larger engine. On a smaller engine though, it will be felt and when mated to the 5 speed automatic the 2.5 liter V6 will not be as responsive and as quick. Price is the second part of the transmission deal since the 5 speed automatic is a $ 1275 option on the 2.5 liter but is standard on the 3.0. If you really want an automatic, it means the larger engine would now "only" cost you an extra $ 4725 and will more than make up for the automatic performance losses. 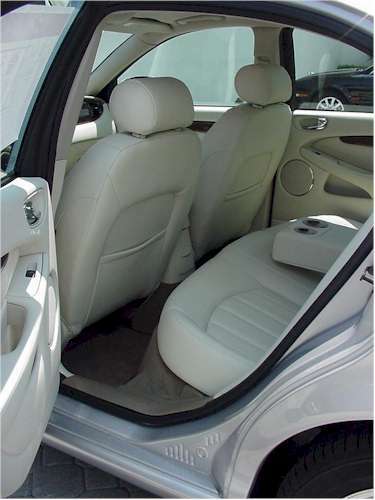 It's worth noting that automatic equipped car have additional wood trim on the console. While the base model comes with all the basic features and amenities one might want, two primary option packages are available ( see table below). The Premium option pack includes many convenient features and is needed for the Sports package which really transforms the X-type personality. 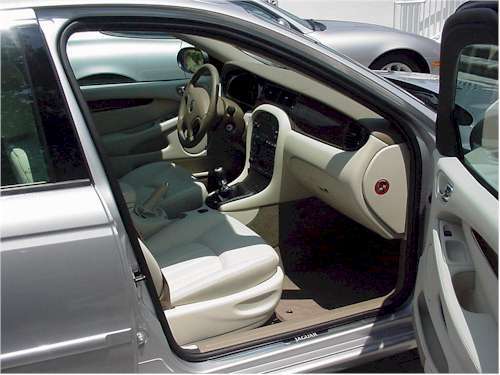 Outside, the Sports model features large 17" sports wheel with wide 225/45 Z rated tires and various color coded trim parts like the grille surround. 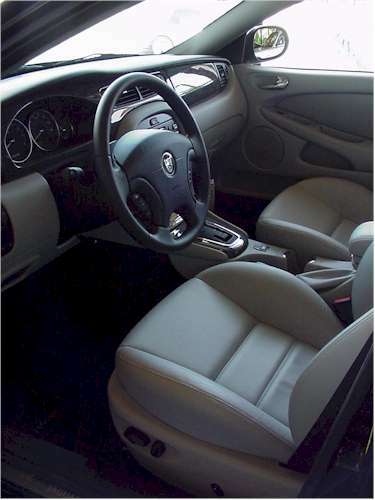 Inside, when you slip into the sports seat the difference is obvious as they offer much more support and yet are extremely comfortable. Of course, while adding these options to the 3.0 engine will raise the price far above the entry level $ 29 950, it does transform a good into... a real ultimate driving machine ! 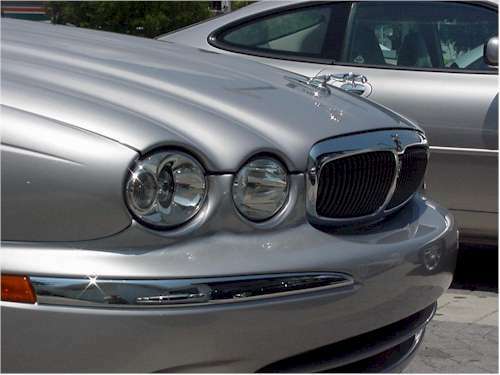 Distinctive Jagur headlights are now slightly oval but still flow into the bonnet. 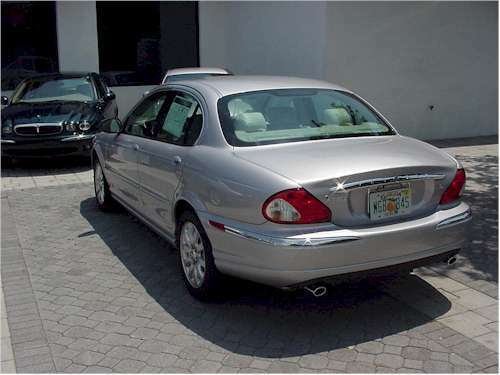 Rear view looks familiar thanks to the light shape, boot lid lines, and haunches. 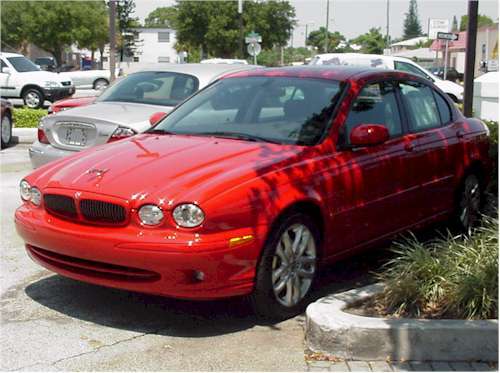 Ticket Red S-type Sport with color coded grille surround.